Jian Liu was born in Guang’an, Sichuan, China, in 1971. He received his B.S. degree in Polymer Science and Engineering from Hefei University of Technology (HFUT) in 1996 and his Ph.D. in Polymer Science from the University of Science and Technology of China (USTC) in 2004. 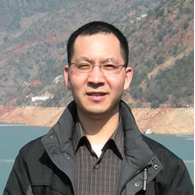 He is currently an Associate Professor of the School of Materials Science and Engineering at the Southwest University of Science and Technology in Mianyang, China. His research work is focused on the design and synthesis of liquid crystal polymers and their electronic and photonic properties and applications. Pteridophyta like texture of a free aggregated Smectic A phase. This photo shows a free aggregation of smectic-A phase of liquid crystal of azobenzene derivatives Bis[4-(n-octyloxy)phenyl]diazene, synthesized by Hejin Zhong. A sub micrometer thick film was initially obtained by solution casting (azobenzene in THF) onto glass slide. After heated into the isotropic liquid state and then cooled to room temperature, the film split into isolated randomly dropwise fragments over the substrate. 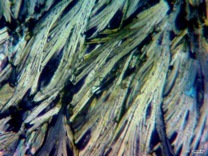 The photo was taken on the edge of an aggregate under crossed polarizers with a 10x objective. Jury comment: This is neither fern nor sea weed. A plain smectic A liquid crystal, spread on a glass plate, mimics leafs of a plant: a greenhouse in miniature.